I no longer believe that. However that does not mean she cannot be helped. Emma can grow, learn and progress as we all can. It just takes her much, much longer and requires a great deal more support. Emma has a stomach bug in addition to her other ailments. She was up on and off all night. Her ears are bothering her, her stomach hurts, her bowels are sluggish and blocked and despite all of this, despite having just thrown up what little food she ate for breakfast, she is cheerful. “Belly go bang bang,” she said, before turning on Michael Jackson’s Beat It. Belly go bang-bang is what Emma calls the sensation she feels before she throws up. It’s an apt description. Right now she is singing to MJ’s incomprehensible lyrics and dancing. It’s a muted version of her usual singing and dancing, but given how uncomfortable she must feel, it’s admirable. No, you really couldn’t. And then for some reason I thought of Donald Trump’s hair. Why this arbitrary and completely ridiculous image came to mind, I have no idea. But it made me smile. His wacky, and timeless, I might add, hairstyle is one of a number of constants in life that make me laugh. I’m grateful for that. 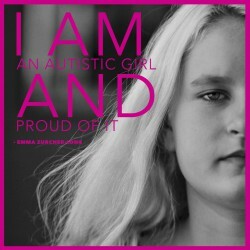 For more on Emma’s journey through a childhood of autism, go to: Emma’s Hope Book. This entry was posted in Autism, Constipation, Parenting and tagged Autism, autistic, Constipation, Donald Trump, laughter, Parenting, sensory issues, stomach flu. Bookmark the permalink. It is funny…..my Emma is always better when she is sick. I think I mentioned this before, but it is one of those things that baffle me. Instead of being miserable and complaining and crying, emma is laughing, and cheerful, and actually more coherent. You have such a great perspective on life, on Emma, on relationships….it really is admirable. I wish I could offer some great advice regarding the poop issue….yes that is what it is called in my house. Emma has struggled with constipation since she was a toddler and I used to sit, and sometimes still do, crouched in front of her holding her hands as she deals with the pain. Last week, we made an emergency trip to the doctors with stomach pain and sure enough, constipation. I have added this stuff called Trufiber to her diet….it dissolves, sort of, in juice and it seems to have helped a lot. e still have poop times, where she has to sit for 7 minutes after lunch and dinner otherwise I am not sure she would ever go. I often think how unfair it is that on top of everything else, she has to deal with chronic constipation. By the way, your blog reminds me of an article I read, I think in the NY times, about the joy of autism. It was written by a man with autism talking about how he would not want to change his autism because it allows him to feel such great joy. I will try to find it and paste it. I’d love to read it Kelly. Do send it if you can. My Em’s constipation is most definitely exacerbated by her “autism.” I’ve read a number of articles regarding sensory issues complicating the toileting process, but if you consider that her intestines may well be sluggish much the way her fine motor skills are also delayed, then her “poop issues” make a great deal of sense. Add to that the fear of going because she knows it hurts and tries to hold everything back because it does, which then serves to impact what is there and it all becomes a nasty cycle that becomes really tough to break. We have given her Miralax, it seems to be helping a bit. It dissolves in juice and is tasteless. (I tried it myself yesterday – just to see what it would do.) It is gentle, but I think persuasive! I had read two on this subject, but the actual article I cannot find…..just this blog one. Sorry. Thank you for the article on fevers. I have been telling this to every doctor we have ever seen, and no one ever gives me credence for it. Do you know if any headway was ever made on the proteins, on replicating them? By the way, I haven’t followed the ongoing research on fevers and autism, so I don’t know.